How Can We Amplify Education as an Engine of Mobility? Education is a potent pathway to success, especially for children from disadvantaged backgrounds. But large gaps remain between different groups of students – in school quality, academic progression, and ultimately educational attainment. How can policies be crafted to address these issues so that education offers opportunity for all? At Opportunity Insights, we use big data to study the role of education in helping children achieve the American Dream. Our research covers pre-school through post-secondary education, focusing on the effects of policies on students’ long-term outcomes. The famous Tennessee STAR experiment randomized students into different classrooms in Kindergarten through 3rd grade. Tests scores went up for a few years, but by 4th grade there was no difference. So did these classrooms matter in the long run? We studied the long-term outcomes of these students and found an unambiguous answer: yes. Better classrooms, even for students as young as 5, had large impacts on college attendance, earnings, and even the fraction of girls who had children as teenagers. Medium-run test scores give a misleading picture, perhaps because better classrooms have persistent effects on children’s non-cognitive skills. Many educations reformers advocate measuring teacher quality based on student test scores, often called “value-added.” But how can we know whether this accurately measures the effects on teachers on student learning, or whether it just reflects the types of students a teacher happens to have in class? We studied 2.5 million students and more than 18 million test scores to show that value-added measures do, in fact, measure the effects of teachers on students. We did so by looking at teachers who switched into and out of grades and subjects. 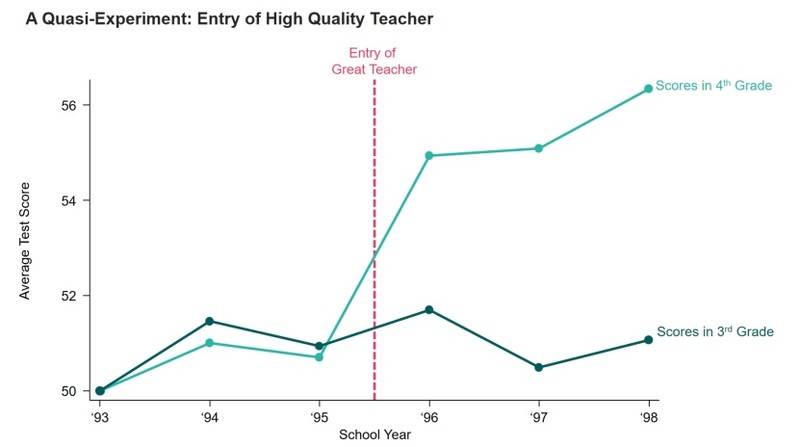 When a great teachers arrives, test scores jump up (and stay high); when a great teacher leaves, we see the reverse. High quality elementary teachers generate large long-term gains for students, including higher college attendance rates and larger earnings. Students taught for a single year by a great teacher (in the top 5% of the distribution of teacher value-added) instead of an average teacher earn $50,000 more over the course of their careers. This adds up to an increase in future earnings of $1.4 million for an entire class taught by a high quality teacher. Students taught by high quality teachers are also more likely to go to college, live in better neighborhoods, save more for retirement, and, for female students, are less likely to have children as teenagers. Access to college varies substantially across the income distribution. 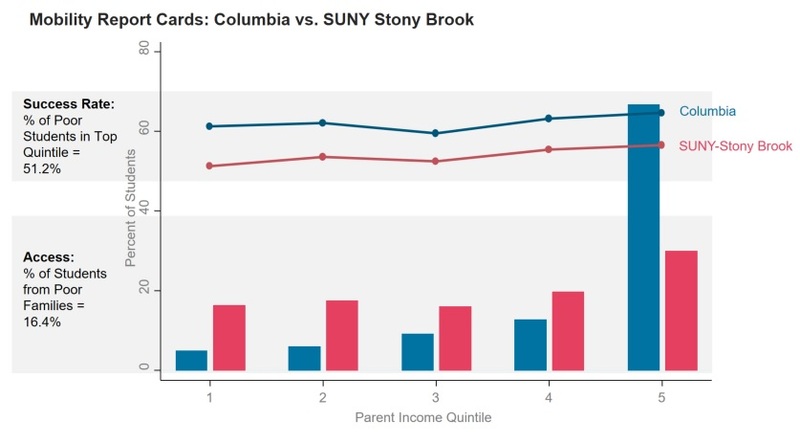 Children with parents in the top 1% of the income distribution are 77 times more likely to attend an elite colleges and universities than children with parents in the bottom 20% of the income distribution. At many Ivy League and other highly selective schools, there are the same number of students from the top 0.1% of the income distribution (families earning more than $2 million annually) as from the bottom 20% of the income distribution (families earning less than $25,000 annually). At most colleges, students from low- and high- income families have very similar earnings in adulthood despite large differences in their backgrounds. Nationally, children from the poorest families are substantially less likely than their peers from richer backgrounds to reach the top of the income distribution. But comparing two students at the same college, this difference almost entirely disappears – a finding that is especially true at highly selective colleges. This suggests that low-income students are not “mismatched” at these elite institutions and that increasing the number of students on campus from such backgrounds could be a powerful policy to expand opportunity. A few schools – including the City University of New York (CUNY) system, schools in the Cal-State system, and UT-Rio Grande Valley – stand out as high-mobility institutions that propel an especially large fraction of their students from the bottom to the top of the income distribution. The mobility rate – the fraction of students that both come from poor backgrounds and achieve economic success – varies greatly across institutions. Elite schools have relatively few low-income students on campus, but those students are very likely to succeed economically. Conversely, community colleges serve many more students from poor backgrounds, but their outcomes are on average lower. Despite this apparent trade-off between access and success, some colleges outperform on both dimensions. You can see a list of the highest mobility schools nationally here. Our on-going research seeks to learn from schools with high mobility rates this to improve mobility rates at all schools. Despite the relatively small number of low-income students attending their schools, certain elite institutions, including UC-Berkeley, Columbia, and MIT, propel more students from poor backgrounds into the very top of the income distribution than their peer institutions. As a result, these institutions are helping create a diverse group of leaders for the next generation. The representation of low-income students at high-mobility colleges has fallen since 2000. Over the past 15 years, the college attendance rate for students from poor backgrounds has risen faster than for any other group of students. But despite this growth in access to higher education more broadly, the fraction of low-income students at high-mobility colleges has fallen. The number of low-income students has also risen only slightly at elite schools, despite expanded financial aid packages and recruitment efforts at many of these institutions. Our results suggest that there are a number of ways in which we can improve the quality of education – and access to it – from Kindergarten to career. For instance, we must improve students’ access to higher education, especially at selective schools. There are too many schools that have low-income students who achieve impressive outcomes, but who admit relatively few low-income students. Policy must be also focused on finding ways to improve the success of students once they arrive on campus. Schools that low-income students attend too often do not support them to get the most from the opportunities available to them, leaving them without the skills they need to reach the middle class. The CLIMB Initiative is a partnership between leading higher education economists and a diverse set of U.S. colleges and universities. Through CLIMB, we seek to understand not only which colleges act as engines of intergenerational mobility, but why, and how schools and policymakers can promote opportunity and economic growth by helping larger numbers of students from disadvantaged backgrounds succeed. By harnessing the power of big data, we can not only understand what works generally, but also how to adapt policy for different types of students across a wide range of schools. Our partner institutions enroll more than 1 million students at four-year schools and another 2.4 million students at community colleges, representing more than 15% of the entire US undergraduate populations at degree-seeking institutions. How much of the variation in mobility rates across schools is due to aspects of the schools themselves, compared to other factors, such as geography or academic focus? How can schools find more qualified students from disadvantaged backgrounds to expand access, rather than institutions targeting the same set of qualified students? What successful programs and pathways do schools already use to support student success, and how can we target the best specific mix of programs for each student? 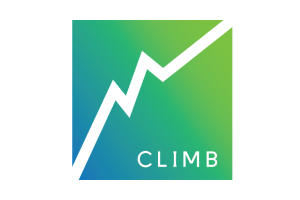 To learn more about our work in the CLIMB Initiative, or to inquire about joining the CLIMB partnership, click here. Explore our downloadable library of data sets, papers, and presentations related to education. Some Colleges Have More Students From the Top 1 Percent Than the Bottom 60. Find Yours. Learn more about our work in the CLIMB Initiative, or to inquire about joining the CLIMB partnership.